Two years ago in Brooklyn, New York, The Elizabeth A. Sackler Center for Feminist Art opened. It was a heralded moment, awaited by women artists who felt their time had finally come. They would now have a place of their own. Overdue recognition of their contributions would at last be acknowledged. In the same time frame, WACK! Art and the Feminist Revolution, curated by Connie Butler, had been mounted in Los Angeles. The Feminist Art Project was up and running. The Museum of Modern Art in New York got in on the act with “The Feminist Future” symposium, an event that was a microcosm of mixed emotions. Attitudes encompassed astonishment that the Museum was having the event, questions about why people cared about receiving MoMA’s validation, references to how the movement still lacked diversity, and comments at the open mics from 70s pioneers who felt persistently overlooked. Art movements, like their political siblings, are messy. People don’t agree, groups splinter, and history is up for grabs. The conversation on who owns Feminist Art History was in full swing at Independent Visions/Feminist Perspectives at The Sidney Mishkin Gallery – Baruch College, held at the end of 2008. The exhibition, curated by Dr. Sandra Kraskin, sought to present works that “while broadly feminist, is neither didactic nor loaded with female imagery.” Kraskin’s stated goal was to focus on women who were not formally connected with the women’s organizations that sprang up in the late 60s and 70s. One of the exhibiting artists, Nina Yankowitz, had set up an ongoing slide presentation. It was geared to addressing the need for a database, which would serve as a strict historical examination on producing female artists of that time frame. The need, as Yankowitz sees it, is for an examination and understanding that would constitute a “true survey” as opposed to a “reconstructionist” one. Yankowitz has been advocating to “widen the frame,” hoping to draw notice to those artists who referenced feminist ideals, but were not employing the feminist “methodology” that has become identified as the “70s brand.” That iconography was strongly embedded in the revival and affirmation of “craft,” and the overt use of body imagery. Yankowitz maintains that “there is room for many voices, and they should all be heard.” She lamented that numerous women had been written out by the younger generation, and stressed her commitment to an overview from a factual stance. She believes that an institution could host such a resource, with the focal point being to put forth examples of abstract, representational, performance, street, and sound art. This strong desire for women to be paid their due was reflected in Yankowitz’s contribution to the Baruch exhibit. Her piece, entitled “Buried Treasures/Secrets in the Sciences” was qualified by Kraskin as “reclamation of the contributions of women scientists through the ages, women whose work has gone unacknowledged, sometimes for centuries.” The parallel to omissions in the art world could not have been more overt. Kraskin spoke to me at length about her motivation for the show. Having started her career as an artist (she was a founding member of WARM in Minneapolis), Kraskin shifted to the Ph.D. track, teaching art history before taking her post at Baruch in 1989. “My experience as a painter gave me a comprehensive perspective,” she explained. 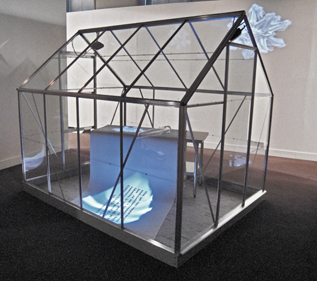 Writing about the exhibit, Kraskin stated, “A dozen contemporary artists are presented in this exhibition of women whose work, while broadly feminist, is neither didactic nor loaded with female imagery.” Discussing her mission, Kraskin clarified, “I wanted to reclaim a section of feminist art of the 70s I thought was being left out.” Enumerating the motifs that are popularly associated with the Feminist Art movement, it was impossible not to touch on Judy Chicago. “I think Judy did something for the movement,” Kraskin confirmed, “but it was just a small part of what was going on.” She echoed Yankowitz’s concern about how women’s art history was going to be archived. “The Sackler Center put women in the news, and the main part of that was Judy Chicago. The Dinner Party (1974-1979) was important, but it was only a part.” Kraskin questioned how the feminist art movement would be documented in history. Needless to say, there is a lot of contention about that. Kraskin believes that because it was such an important movement and it did change the art world, it is essential to reexamine. “I don’t remember the 60s and 70s being like the shows I am seeing now,” she said. The feedback she got on Independent Visions/Feminist Perspectives reinforced how complicated the issues are. Visitors would point to an artist in the show and say, “She wasn’t part of the women’s movement.” Kraskin also found herself fielding inquiries about why there were pieces about science included. Desmarais pointed out that the EASCFA was “still fairly new” and that as it evolved, so would a continuum of perspectives. Desmarais said that there are plans to establish a Feminist Art Base. “We recognize the need and are committed to it,” he said. The new curator, Catherine J. Morris, will put the specifics for the submissions process in place. This article originally appeared on the website cultureID.